About two years ago, a researcher for Molly O’Neill contacted me about a pickled green tomatoes recipe that I had posted from my sister Angela. She liked the family twist on the recipe and interviewed both of us, but when we didn’t hear anything back we assumed that the recipe had not been selected for her upcoming book. So you can imagine my surprise when I received an email last fall announcing the arrival of One Big Table, and then my delight to learn that they had included the recipe (page 71). Even if our recipe had not been included, I would have bought O’Neill’s book in a heart beat. It’s more than just a cookbook, it’s full of stories of the incredible bounty of dishes that make up American cuisine, and is as eclectic as the mix of people who’ve chosen to make this country their home. There’s a certain romance, a sense of nostalgia brought on by flipping through the pages and spotting names of dishes that I remember from childhood or even my travels overseas, and I appreciate the evident care taken to absorb the depth and breadth of the cultures represented in our country. The book features many food bloggers, some you may recognize and others may be new to you: Todd Porter and Diane Cu, Doug Ducap, Manisha Pandit, Ben Herrera Beristain, Annie Lau, Deseree Anne Kazda, and too many more to list here. 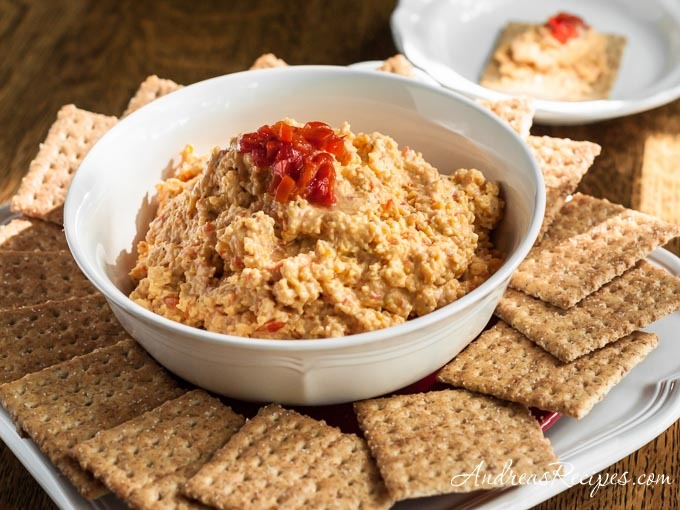 While we were visiting my parents over spring break, my mother chose to make Dorothy Steen’s Award-Winning Pimento Cheese Dip (page 56). 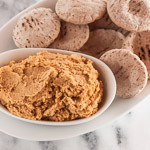 Pimento cheese dip (aka Carolina Caviar, Atlanta Pâté, and a few other colorful names) is a southern classic with many variations. The basic recipe has sharp cheddar cheese, mayonnaise, and a jar of chopped pimentos, and after that it’s up to the cook’s tastes. 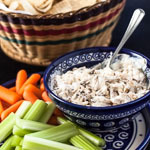 You can serve it chilled or baked, it’s entirely up to you, just have a pile of crackers or pita chips ready and you’ll have a fast and delicious southern treat for any party. 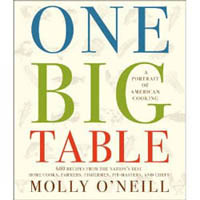 I am giving one copy of this terrific cookbook along with a signed bookplate from Molly O’Neill. To enter, leave a comment telling us about your favorite family recipe. Please make sure your email address is correct so I can contact you if you are the lucky winner. Apologies to my international readers, but the book can only be shipped within the continental U.S. The contest closes at 8 P.M. EST on May 9, and Random.org will select the winner. Look for the announcement of the winner in this post soon after. UPDATE: Congratulations to Lisa S., winner of the book and signed bookplate! Adapted from One Big Table, by Molly O’Neill. In the bowl of the food processor, process all ingredients until combined but slightly chunky, about 15 seconds. Transfer to a serving bowl, cover, and refrigerate until the cheese has set and the flavors blended, about 2 hours. Serve with whole grain crackers or thinly sliced baguette. ‘though born a Yankee, I’ve lived in Virginia for 21+ years – I never knew what I was missing until I tasted Pimento Cheese sandwiches! This looks yummy! My fav family recipe is for Rice and Peas (small red beans) – a Caribbean dish. Everyone makes it differently but it is a staple for Sunday dinner. My favorite family recipe changes with the season and my mood. I get homesick a lot, and making something from a family recipe can surely be a comfort. My grandmother’s really delicious spaghetti sauce, my mother’s boiling water chocolate cake with peanut butter and coffee icing, the cabbage balls we all make and serve over mashed potatoes- doesn’t matter which one of us made it, it tastes exactly the same. My mom surprised us with a cookbook she made up last year with family recipes from her grandparents to me and others of my generation. She gave copies to her sisters and brother, her nieces and nephews, and me and my sister. It will always be one of my greatest treasures. Great give-away! I love collecting family recipes. My favorite is my Grandma’s coconut bars. I think my favorite recipe is thin pancakes – 1 cup flour, 1 cup milk, 2 eggs, a tablespoon of sugar, and a pinch of salt, dumped in a blender, then cooked as usual. I also like my mom’s chile relleno casserole, which I haven’t seen anywhere else. we all have different favorites, but i can generally count on everyone being excited for our family homemade pizza. i use a betty crocker crust (substituting a cup of whole wheat flour) and whatever toppings people are in the mood for. my husband and i love the deep dish version. In the winter, my dad’s chili is the best. In the summer, my mom does a classic potato salad. My mom spent a good chunk of the ’80s perfecting her chocolate chip recipe (my sisters and I were very willing taste testers). She’s got it down pretty well now, that’s definitely my favorite family recipe. My favorite family recipe is my Grandmother’s scrippelle m’busse, which is a savory crepe lightly filled with grated romano cheese and cracked black pepper served in chicken broth. There’s no written family recipe and I didn’t really learn to make the batter for the crepes until a few years ago. It’s a ton of work but it’s yummy! boiled eggs, cheese sauce and ham. Everyone looks forward to it each year. I grew up in Savannah, GA, and one of my favorite meals as a child was one of my father’s specialties. He called it “Chicken Country Captain.” When I was little, I was convinced he made up the dish. Now that I’m older (and slightly better informed) I have discovered that it is fairly well established classic. My family favorite is soft ginger cookies. We only make them at Christmas & I look forward to them all year. New reader here and Love your blog. My favorite family recipe is my Grandpa’s Cinnamon Rolls. My Mother tells us that he had tasted them at a favorite restaurant and decided to “copy” them at home. After many batches, he came as close as one can without having the original recipe! Thanks for the opportunity to hear about this cookbook. I read cookbooks like others read romance novels! My favorite family recipes are my Mom’s Deviled Eggs and my husband’s Ragu Sauce. This looks like a great cook book. My family favoite recipe is my mom’s potato salad. Summers coming and she will start to make it again. Can’t wait. It would have to be a tie between my grandpa’s spaghetti sauce (handwritten on an old, oil-splotted piece of paper) and my dad’s cornbread dressing. Both are so good! A true favorite family recipe in our house is our Fancy Baked Mac and Cheese. The kids love it and, truth be told, so do the adults! A meal that I have made a family favorite is Pernil with yellow rice & peas. I am not Hispanic but I have perfected it and we love it!! Macaroni! It is actually baked ziti my 91 year old grandma still makes every Sunday for everyone, but I have always known it as Macaroni. And meatballs, ‘course. 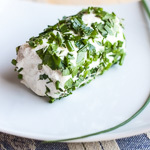 One of my favorite family recipes (there are so many!) is pasta primavera with a very garlicky sauce and lots of fresh veggies. Ranch shredded cheese bacon chip dip. Thanks. Even though Mom has been gone for over 10 years, I still savor the taste of her boiled squash and sausage gravy. Reminds me of cold winter evenings and the family at the table for supper. Such a comfort food! One of our family’s favorite recipes is an old fashioned carrot cake recipe that I got from my grandmother. When my daughter left home, I made a handwritten cookbook for her and made sure the recipe for this cake was in it. It is her favorite recipe. My favorite family recipe is for my great-grandmother Sophia’s Capusta. A Polish dish of cabbage and lots of dill. Delicous! So, I just missed the cutoff, but couldn’t help but share my favorite family recipe. My grandmother’s Cornbread Dressing. It takes preparation days ahead of baking cornbread and laying it out to get stale, along with some white bread, but the results are worth it. My husband told me when we celebrated our first Thanksgiving that he hated stuffing or dressing. I offered him a taste of this recipe and he was converted! This book looks like a great addition to any cook’s shelves, especially when having guests over from around the country. Thanks to everyone who entered the giveaway. Entries are now closed. Stay tuned for the announcement of the winner in this post.